In a subsequent article in New York Magazine, Professor Dweck describes how we, as parents, can inadvertently foster a fixed mindset in our children by focusing on results instead of effort. This may then lead to adverse consequences relative to how they view challenges, obstacles, and criticism as they grow older. So what does this have to do with big data and the enterprise? There is general acknowledgement that enterprises lack the specialized skills to take advantage of the rich data sets available today, and many believe that this deficiency is the primary inhibitor to big data adoption. However, a number of companies such as Tableau, Splunk, Mu Sigma, Platfora, Paxata, Trifacta, DataHero, ClearStory Data, and others are addressing this lack of expertise by democratizing data access, manipulation, and analysis. The real impediment – the one that cannot be solved with technology alone – is mindset. Traditionally, enterprises have viewed data as a liability that could work against them in the event of legal action or a security breach. As such, companies had strict governors around data access and retention. Data was promptly and properly disposed of when it was no longer required for policy or legal purposes. This current data mindset results in organizational behaviors that make it impossible for enterprises to realize the potential of big data. In this new era, forward-thinking organizations collect everything and throw away nothing. These companies maximize (rather than minimize) data collection and retention. 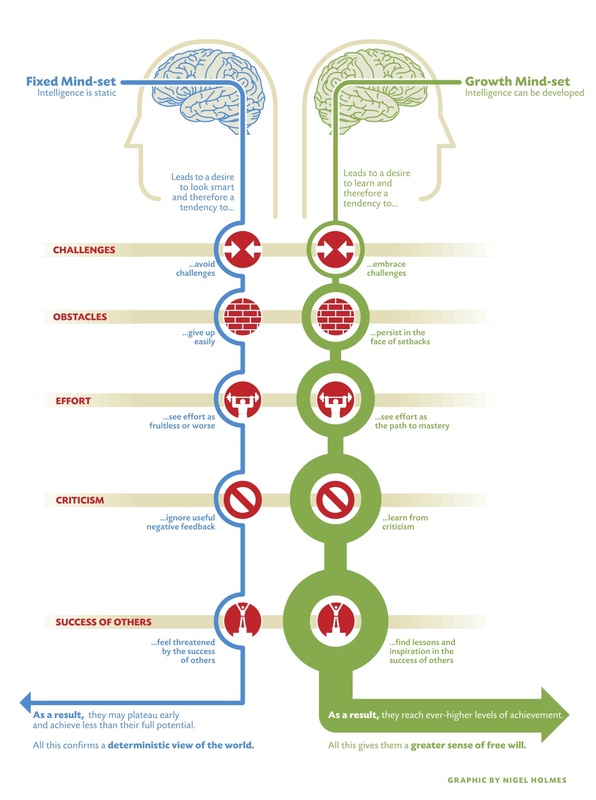 In her research, Professor Dweck describes how those that adopt a growth mindset can achieve much more than those with a fixed mindset. She also prescribes how one can successfully transition from a fixed to a growth mindset. In order to fulfill the promise of big data and see it adopted more broadly, a similar shift in mindset needs to occur: enterprises must view data as an asset/enabler instead of a liability. Think big and start small. Delivering immediate value will be key to gaining broader big data adoption. Focusing on a specific department, data subset, and/or use case with well-defined goals and milestones will mitigate risks and concerns of mission/scope creep, project overruns, and potential failure. At the same time, having a clear vision of the desired ‘to be’ state will be important for initial buy-in as well as to power through obstacles that are bound occur during the initial project. Leverage ancillary data to gain permission. Gaining access and leveraging sensitive, system of record data related to financials, inventory, purchasing, pricing, suppliers, partners, and/or customers will be difficult if not impossible. Data that has traditionally been neglected or ‘left on the floor’ such as web logs, alerts, messages, scripts, metadata, archives, directories, and configuration files may be much more accessible. This forgotten data may contain useful information related to users, transactions, sessions, and events that when analyzed in aggregate across time, may reveal interesting patterns not previously known. Early success delivering insights using non-traditional data sources may then provide the necessary permission to access and analyze system of record data. Use lighthouse organizations to show the way. Given the choice, companies (i.e., executives) would prefer to be seen as industry leaders/innovators instead of laggards. By giving specific examples of how web-based and forward-thinking companies are leveraging data to manage and grow their businesses and then explaining how these use cases are applicable to traditional industries and companies may create interest and excitement with executives to champion new initiatives around big data. As big data enters the trough of disillusionment, it is important that both enterprises as well as vendors demonstrate success. Changing the current data mindset will be key. Do you have other suggestions for overcoming the view of data as a liability? What do you think is the biggest inhibitor to big data within the enterprise?